Examples, solutions, videos, and worksheets to help Grade 5 students learn how to convert decimals to percents. 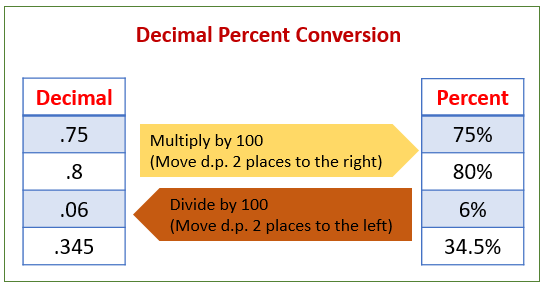 The following figure shows how to convert between decimals and percents. Scroll down the page for more examples and solutions. How to convert a decimal to a percent? 1. Move the decimal point two spaces to the right. 2. Add the % sign. This video covers a few examples of converting a decimal into a percent. Remember to move the decimal point to the right two spaces. A decimal can be written as a percent by moving the decimal point two places to the right. For example, to write 0.4 as a percent, move the decimal point two places to the right to get 40. So 0.4 can be written as 40%.